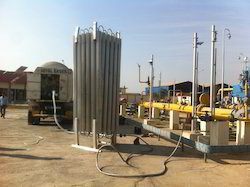 Leading Manufacturer of nitrogen purging from Ghaziabad. We provide liquid nitrogen in bulk for cross country pipeline purging & pigging with liquid nitrogen tanker onsite with all required equipments as vapouriser, PRV station, Pr. and temp. gauge on trunky basis. We have suceesfully done nitrogen purging for IOCL, GAIL, IGL and Bio gas plant.